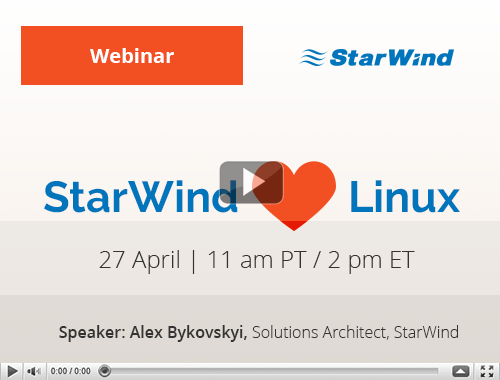 StarWind Virtual Storage Appliance is a good opportunity for users who don’t want to change their current infrastructure to quickly deploy StarWind to test its features and functionality. StarWind Virtual Storage Appliance supports multiple hypervisors including Microsoft Hyper-V, VMware ESXi, XenServer, which is coming soon and KVM. StarWind Virtual Storage Appliance can be managed with StarWind Web Console while providing vSphere plugins for thick and thin clients providing flexible and convenient management for ESXi hypervisor. StarWind Virtual Storage Appliance doesn’t require Windows licenses and can be downloaded as a virtual machine for free. The webinar further provides a quick demonstration on how to deploy Virtual Storage Appliance on KVM, Hyper-V and ESXi hypervisors. For quicker demonstration, two nested KVM virtual machines with preconfigured VSA are being preinstalled. In the Virtual Machine Manager, StarWind has added “VSA Network Setting”, for configuring networks for VSA, and “VSA Storage”, for configuring storage, in the Configuration tab. The demonstration further shows how to create a new standalone StarWind VSA device using StarWind Web Console. For this, the type of the device (thick-provisioned or LSFS must be chosen and the block size of device and cache specified. After this, a replication partner is configured to create the HA device. For this, the IP address must be specified and heartbeat option selected. Further, synchronization channel must be created. After this, the partner device is created. The video further shows the StarWind Virtual Storage Appliance deployment process for Hyper-V. First, a new virtual machine must be created using Hyper-V Manager where the name, location, generation, and memory must be specified, networking configured and the virtual hard disk connected. After this, the virtual hard drive must be added to the virtual machine. For this, disk format and type must be chosen, name and location specified and size configured. Next, storage pool must be configured. The video further demonstrates how to deploy the StarWind Virtual Storage Appliance with VMware ESXi. The process starts with the deployment of the OVF template. After the deployment is finished, a new thick-provisioned virtual disk must be added and the StarWind VSA virtual machine connected via StarWind Web Console. Next, the networking settings must be configured and the new volume created. After this, a new virtual disk must be created for ESXi host and new volume created. Finally, the new datastore and virtual machine can be created.